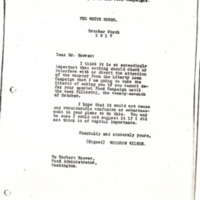 Copy of Letter from the President in re Liberty Loan and Food Campaigns.THE WHITE HOUSE. I think it is so exceedingly important that nothing should check or interfere with or divert the attention of the country from the Liberty Loan Campaign that I am going to take the liberty of asking you if you cannot defer your special Food Campaign until the week following, the twenty-seventh of October. I hope that it would not cause any considerable confusion or embarrassment in your plans to do this. You may be sure I would not suggest it if I did not think it of capital importance. Wilson, Woodrow, 1856-1924, “Woodrow Wilson to Herbert Hoover,” 1917 October 9, WWP19210, Hoover Institute at Stanford University Collection, Woodrow Wilson Presidential Library & Museum, Staunton, Virginia.